-->> here you can see the file, named "BCD" is called "BCD store". -->> which controls, how your operating system is going to boot and what are different parameters for booting and which partition contains the windows installation files. -->> you can do magic with this tool, also it has a nice GUI. -->> Playing with boot entries is more interesting rather than changing/editing MBR codes. -->> If you want to add a boot entry for your linux distro, of-course you can do this easily with this tool. 1. Introduction to different options in EasyBCD. Introduction to different options in EasyBCD. 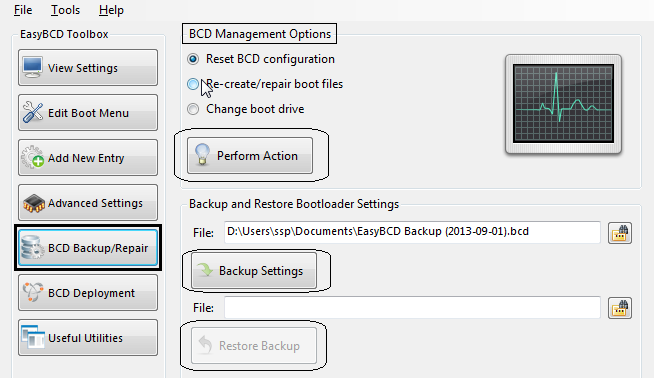 store options and also you can add/edit multiple boot entries into BCD configuration file. "Refresh BCD Store":- this will Refresh the cached BCD configuration data. Boot.ini file located in active partitions of your Hard Drive. default boot entry will automatically loaded. if you select a external BCD store. ~ we can also Add a new boot entry for MAC OS. if you know the power of GRUB4DOS than this options is much and more useful for you. 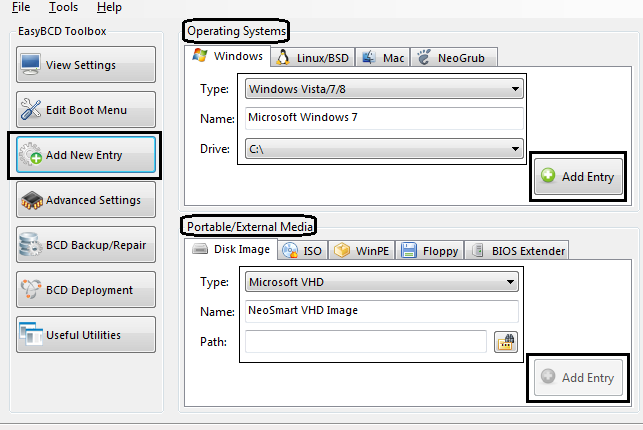 "Portable or External Media":- you can use to ADD boot entry for these items. ~ Booting from Floppy images. if your BIOS does not support it. EasyBCD will check and correct each Boot entry, if possible. 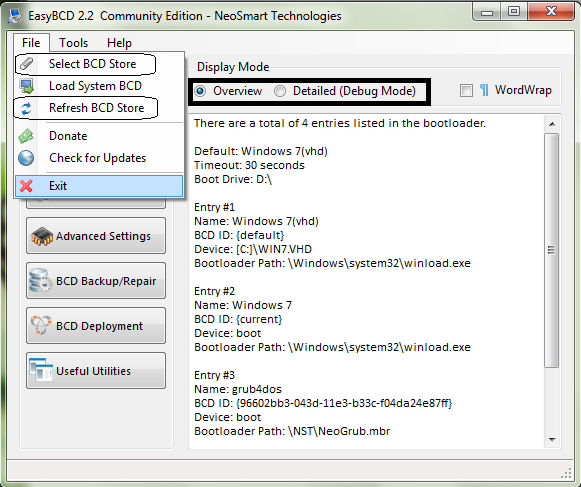 current BCD entries over, and make the selected partition both active & boot-able. database for BCD Store. and will be crated in the partition you select. "EasyBCD Power console, gives you power to play with Command line tools. -->> after installing windows8 with pre-installed windows7 computer, when you boot, you will see windows8 boot loader with all entries in it. -->> if you boot your PC in this way, i observed it takes much more time as well as when we switch between them. because first win8 boot loader comes and then ask to select any one boot entry. 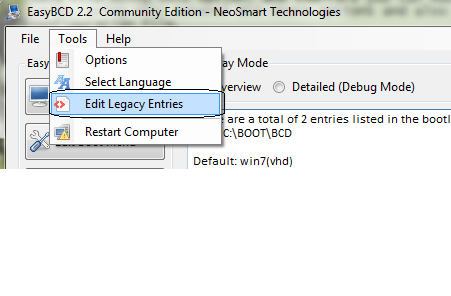 -->> if you re-create BCD store for your computer in windwos7 environment and then manually add boot entries for them then only windows7 boot loader will ask you for select one of them, and this boots much more faster. -->> similar problem comes here as i discuss above, if you are going to use your windows8 default boot loader. -->> So i recommend you to follow these steps. 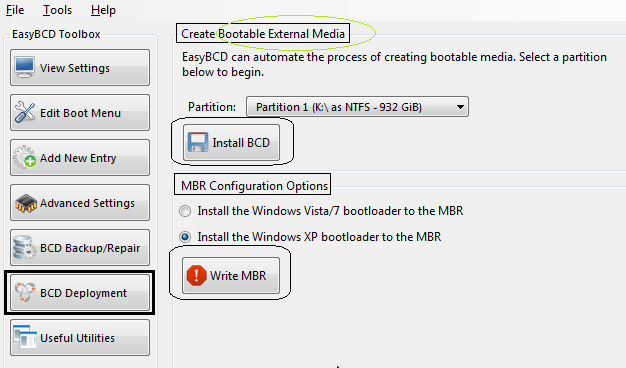 Re-create BCD store ~ and manually add boot Entry for win7 ~ and for windows8, choose "Portable or External Media" and Add your VHD file, NO Matter it is fixed size or Expandable. -->> this will boots perfect. -->> If you follow any of Above steps in Wrong Manner than you won't be able to boot your Existing OS, either it win7 or win8. -->> LinuxMINT use GRUB2 as default boot loader, if any case your LinuxMINT is unable to boot than you this fix this problem using EasyBCD very easily. 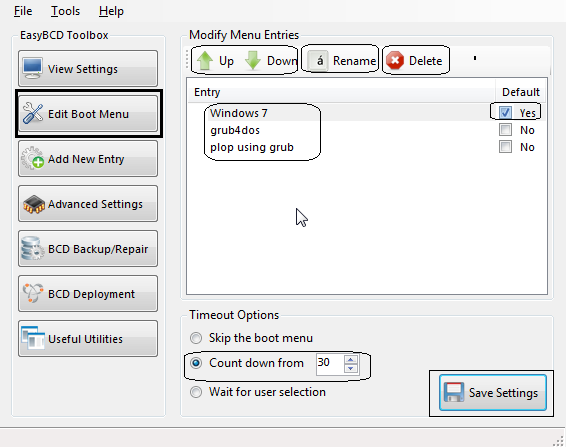 -->> go to "Add boot entry" ~ "Linux ~ select type as ~ grub2 ~ Automatically load and locate boot config file "
-->> this works fine if you only installed one Linux operating system on your PC.